Get More Out of Your Ride. For anyone who needs another excuse to spend money on motorcycle customization, we’ve rounded up a list of 5 aftermarket modifications that deliver the best value-to-dollar-spent ratio. Read on and get ready to open your wallet. #1 Tires: When most people think of getting better performance out of their motorcycle, they look at making more power or improving suspension. Although those are both great options to explore, both are expensive and won’t provide maximum benefit unless you’ve already done the single best bang-for-your-buck mod: get the right tires for your bike and riding style or replace worn tires with fresh, new sticky rubber. Tires are the best bang-for-your-buck motorcycle mod. Period. Unlike car tires which have a flat profile, motorcycle tires have a wide range of profiles and are made from a variety of compounds which drastically affect your bike’s behavior. Acceleration, braking and cornering performance are all dependant on tire choice. The rubber used in a sport motorcycle tire is relatively soft and typically engineered for more grip, at the expense of quicker wear. As with all rubber, its characteristics change over time, hardening and degrading, even without being ridden (environmental factors such as temperature and humidity play a part here as well). As a general rule, we recommend changing a tire that’s over 5 years old, regardless of how much tread is on it. The sportier your riding style, the more important this becomes. The manufacturing date of your tire is actually stamped on its sidewall which is a handy reference, especially if you bought a bike second-hand. The tire pictured above was manufactured in the 14th week of 2011. Think of it this way: everything about your bike, from that big displacement motor it’s got to that high end suspension you paid extra for -all rides on 2 hoops of rubber. Settling for anything but the a great tire is a compromise that transcends the entire motorcycle. Speak with knowledgeable sources (us, or others) and experiment to find the tire that’s best suited to you and your bike. No amount of reviews, forums or ratings can truly convey how good the right tire feels, literally transforming your bike when you find the right fit. #2 Grips: The least expensive mod on our list, spending $20 on a pair of good grips can help reduce vibrations, increase comfort and (obviously) provide better contact between you and the bike. OEM grips are a mixed bag these days, some offering rock hard rubber while others offer pillows. It all comes down to personal preference but we find the Spider Peak grips to be a good balance of form, function and price. White-knuckle in style with a new set of sticky, affordable grips. #3 Seat: Many essential bike mods address the points where the rider makes contact with the bike and nowhere is this more apparent than when it comes to the seat. Comfort and aesthetics are the obvious ways in which this mod can benefit you, but the less obvious and more important role your seat plays is to regulate your position on the bike. The angle, shape, height and profile of a seat can make a significant difference in how your weight is distributed on the motorcycle. The lighter the bike, the greater the impact of shifting the high sprung weight known as, well, you. Considering that a 200 lb rider can account for up to 50% of a bike’s weight, where that weight is placed on the bike (fore or aft) can dramatically alter a bike’s performance. Lacking front end feel? Look for a seat that moves you closer to the tank. Want to become a wheelie master? Find a seat that allows you to shift your weight back. The right seat can literally transform a bike. The scalloped profile of this seat favors a more forward riding position and has a dedicated pillion “hump”. #4 Exhaust: Although a more expensive mod than any other on our list, exhaust modifications can make a motorcycle significantly more enjoyable to ride. The important thing to keep in mind when considering an exhaust modification is how it will impact your bike’s fueling. There for more than just sound and emissions control, a motorcycle’s exhaust system regulates the flow of spent gasses as they escape from the motor as the final component of the fueling system (the process begins with air passing through a filter, coming into the motor, being mixed with gasoline, the mixture being ignited by the spark plus(s) and finally finding its way through a catalytic converter and out your exhaust plumbing). In certain circumstances, simply replacing the OEM muffler with an aftermarket one can present advantages: lighter weight, better sound, increased horsepower and more pleasing aesthetics. What many riders don’t realize though is that this modification can actually reduce horsepower, fuel mileage, cause surging/bucking or even premature engine failure (usually as a result of improper fueling over time). Since replacing the exhaust changes the flow of fuel through the motor (and the associated backpressure), the bike’s computer will need to compensate by altering the fuel mixture. In a perfect world, this would happen seamlessly, but that’s not the case in reality. Most modern day bikes use microcontrollers (also known as Electronics Control Units or “ECU’s”) to control the fuel mixture but these systems are not always flexible enough to adapt to a change as significant as a new exhaust. For this reason, modifications to the air/fuel system often benefit from re-programming (or “re-mapping”) of the ECU to account for the specific modifications. If you ride an older bike with carburetors, you can do a simple re-jet which achieves the same result, is simple and effective. Getting advice from a reputable tuner and speaking with owners of the same bike who have made similar modifications are a good way to ensure you’ll get the best bang-for-your-buck out of this mod. 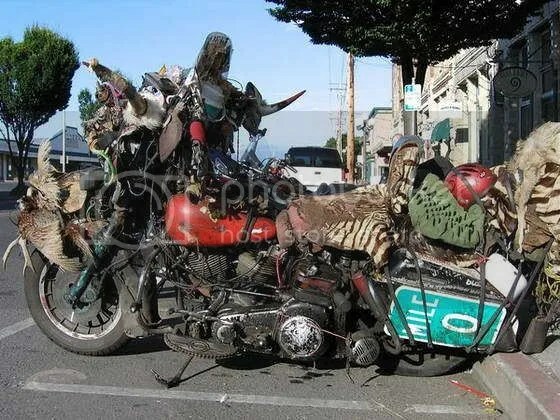 Lastly, if you ride a new motorcycle that’s under warranty, check with your dealer and make sure you understand their stance before undertaking this type of modification. Improved sound, aesthetics, performance and weight savings are all benefits that can result from the right aftermarket exhaust system. #5 Photochromic Face Shield/Insert/Glasses: The gear that you, the rider wears is as an extension of your motorcycle. As such, upgrading or acquiring the right gear can drastically improve your riding experience, which is why we’ve included this “mod” in our list of essentials. For the longest time, riders had to chose between carrying multiple face shields (clear and tinted) or wearing sunglasses in their helmets. Fast forward to the 21st century and photochromic technology is now mainstream, available as an aftermarket shield for most popular helmet brands (the Bell Photochromic Face Shield is one such example). There are also photochromic pinlock inserts available to suit a wide variety of helmets, so there’s a good chance your current helmet is compatible. If you prefer riding with sunglasses on, a pair of shades with photochromic lenses, such as Oakley’s line of Transitions models is a good option. Photochromic technology: now you can have both light and dark shades in one solution. As always, if you need help finding the right gear, we’re here to help. Drop us a line any time and don’t forget to follow our blog (below) and like us on Facebook for the latest news. Great list! I’ve done the rubber, grips and photochromic visor (love the last one). I was going to do exhaust, but a new bike is about to enter the stable, so I’ll save my money for that one! Great list! I’ve recently changed tires and after over $2000 in suspension improvements, i finally feel confident in my FZ-09’s handling. It is difficult to understand what more confidence feels like until you feel it. I look forward to curves now and attack with confidence. Enter your email to subscribe and receive updates when new posts are published. Click to subscribe and receive email updates when new posts are published.